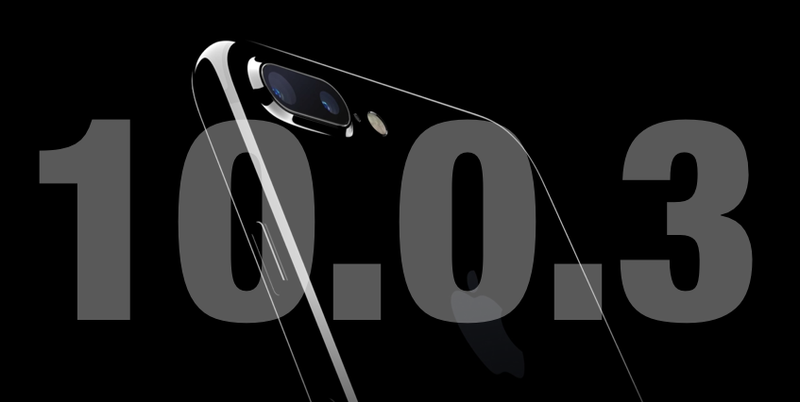 Apple iPhone 7 and iPhone 7 Plus smartphone users can upgrade to iOS 10.0.3 Firmware (Build: 14A551) Update to experience all new features and functionalities changes. The Latest iOS 10.0.3 Update is currently limited to above mentioned iPhone specific devices, and it's further expected that other remaining iPhone, iPad and iPod touch users i.e. iPhone 6S, iPhone 6S Plus, iPhone 6, iPhone 6 Plus, iPhone SE, iPhone 5S, iPhone 5C, iPhone 5, iPad Pro, iPad Air 2, iPad Air, iPad 4G, iPad Mini 4, iPad Mini 3, iPad Mini 2 and iPod Touch 6G will soon get their iOS Update from Apple too. The official iOS 10.0.3 Changelog includes "iOS 10.0.3 fixes bugs including an issue where some users could temporarily lose cellular connectivity". The final iOS 10.0.3 OTA Update (over-the-air) is also available through Settings >> General >> Software Update option.